Below is our December 2018, holiday edition of ‘Coming Up For Air’, a monthly column we write for Ming Pao’s English language section, reprinted here in its entirety with the permission of the folks at Ming Pao. 【明報專訊】What do the winter holidays mean to you? Last year at this time we were still getting things set up at our bookshop in San Po Kong. Rachel, our awesome shop manager, had just started working at Bleak House Books. We still had a lot of shelves to fill and books to price. And we had just hosted our first ever event complete with a plastic “Charlie Brown tree” from Ikea. This year things are a bit different. Our shelves are now well-stocked with a carefully curated selection of new as well as used books. We have hosted our fair share of events from school field trips to poetry readings to book launches. 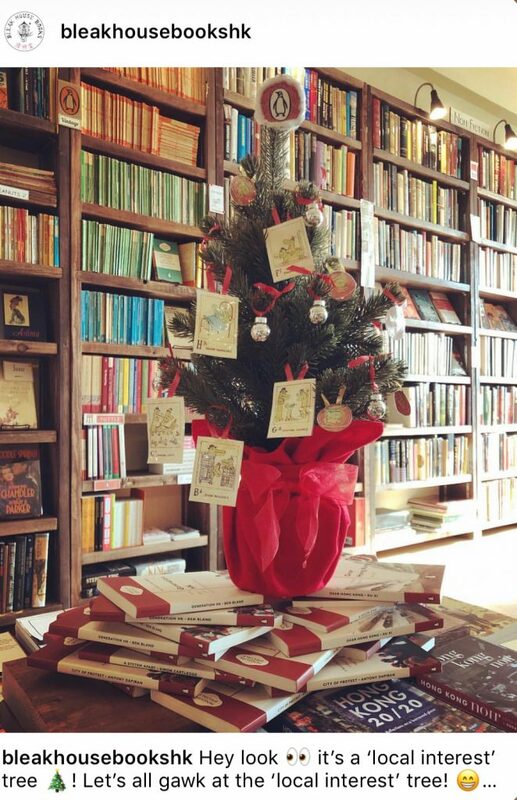 And the dinky tree that we bought for last year’s inaugural event makes a return appearance, this time serving as both holiday decor and as the Bleak House Books “local interest” tree. This year we also decided to have a little fun for the holidays. As bookshop employees we have ready access to a lot of literature written by a wide range of authors but we rarely get to write any of our own. So in what we hope will be the start of an annual holiday tradition, we are treating everyone to some home-made poetry and jingles, Bleak House Books-style! Although each piece is penned by a different member of the Bleak House Books family, we decided not to attribute authorship to any of them. This is because the last time anyone here wrote a piece of fun, nonsensical prose, we were all a lot younger and there was, frankly, less on the line. Needless to say those days are long gone. Folks who want to know who wrote which poem will just have to engage in some guesswork. But we don’t think that will be too hard. So without further ado we bring you A Very, Merry San Po Kong Christmas, a joint production of Bleak House Books and its three resident bookworms! And a char siu way too salty. Sneaky elves placed book-shaped gifts ‘neath their trees. But Christmas is coming so let’s take a selfie! This entry was posted in Coming Up For Air (Ming Pao), Hong Kong and tagged Christmas, Gifts, Holidays, Hong Kong, Hong Kong Food, Malls, Poetry, San Po Kong. Bookmark the permalink.